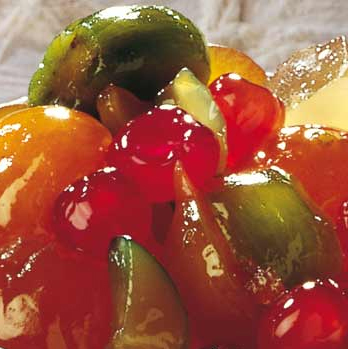 The mostarda di Cremona is a perfect side dish for boiled meat. It has mixed flavors, sweet and spicy, and it’s like a decoration for the table with its colored and shiny fruit. You can serve the Mostarda di Cremona directly on the table in little plates. Prepare the fruit. Cut the pears in four, after peeling them and removing the core. Remove the stems of the cherries and wash them. Do the same thing with figs. Peel the apples, remove the core and cut them in pieces. Cut the apricots in half and remove the pit. Do the same thing with peaches. Put one liter of water in a pot. As soon as the water is warm, add sugar and mix until it is completely melted down. Add the fruit in the pot: apples first, pears after 20 minutes, peaches after 5, apricots after 5, then figs and cherries. Close the pot with a lid and cook it for 10 minutes more. Turn it off and let cool down. Meanwhile warm the vinegar and put the mustard inside, mix accurately and let cool down. Put the fruit in jars. Add vinegar and mustard to the remaining syrup and add it in the jars. Close them accurately and keep them in a cold and dark place.